Folk music history is brimming with musically talented families, but few have maintained such a firm grip on a certain narrative style of songwriting quite like the Guthrie Family. While Woody Guthrie remains one of the craft's most innovative and trail-blazing forebears, those who came before and after him have contributed to the American songbook in lasting, sweeping ways. Learn more about the Guthrie family - from Jack Guthrie down to Sarah Lee and Cathy - with this brief profile and family tree. Jack Guthrie (born Leon Jerry Guthrie) was Woody's cousin and one of the first people with whom Woody explored music. Jack grew up playing guitar and fiddle, and he had a deep fascination with the cowboy lifestyle. By the time he was a teenager, Jack and his family had moved to California, where he took to modeling his music persona after the great Jimmie Rodgers. He started practicing his yodeling and fancied ​himself a future as one of Hollywood's singing cowboys (he actually competed in a rode for a spell). He and Woody performed on the radio as the Oke & Woody Show, but Woody's interests were not the same as Jack's and they parted ways. He joined the Army and performed elsewhere, and eventually died of tuberculosis in 1948. Woody Guthrie was one of the most hard-traveled, highly praised folk singers of his time, and continues to be one of the most influential artists in the history of the craft. Born in Oklahoma in July of 1912, Guthrie tried his hand at several pursuits - fortune-telling among them - before dedicating his life to the craft of songwriting and storytelling. First with a family band of sorts known as the Corn Cobb Trio, then later as a traveling troubadour who made his way by singing at union halls for subversive crowds, Guthrie quickly became a darling of the New York City folk music scene. His influence on Bob Dylan rocketed him to the status of the godfather of the "revivalist" movement in the mid-1950s and 1960s and has kept his music relevant all these years. Arlo Guthrie was born in Coney Island, NY, in 1947, the oldest son from Woody's marriage to Martha Graham dancer Marjorie Mazia. Growing up in a household where Woody was already a seminal figure of a burgeoning popular folk song movement in New York, Arlo was exposed early on to folks like Pete Seeger and Ramblin' Jack Elliott, who took it upon themselves to idolize his father. His early musical influences also included radical folk singers like Lee Hays, Leadbelly, and others, and it wasn't long until he was playing guitar and harmonica like his father. He performed for the first time in 1960 at the age of 13 and hasn't stopped since. Cathy Guthrie is another one of Arlo's daughters and a self-described "musical holdout" among her family members. Acknowledging the musical momentum perpetrated by her family line, however, she eventually joined forces with her friend Amy Nelson (Willie's daughter) to form a guitar-and-ukulele-driven folk duo called Folk Uke. Together, she and Nelson deliver so-wrong-it's-right songs ​about difficult things like heartache, loneliness, and abuse. Not for the easily offended, but wickedly entertaining for those who aren't. Abe Guthrie is the son of Arlo Guthrie and grandson of Woody, whose interest and skill for music started early. According to his official bio, he traded a neighborhood kick his Big Wheel for a keyboard when he was just three years old. By the time he was a teenager, he was working for David Bromberg as a guitar tech. Soon after, he started playing in Arlo's backing band as keyboard player. But it was as keyboardist for '80s rock band Xavier that he really stretched his wings, using the instrument to cover much of the rhythm section. But, despite his involvement with Xavier (who finally released their first album in 2000 on Rising Son Records - his father's label), Abe tours with Arlo and has filled in as a producer on other family albums. 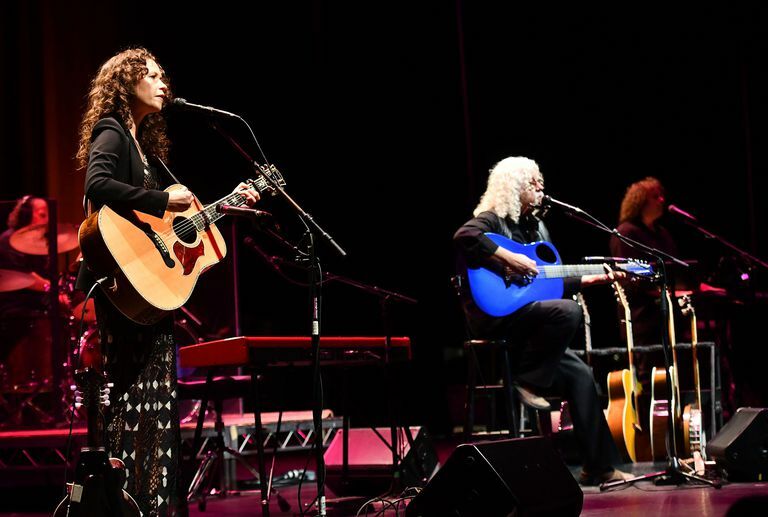 Sarah Lee Guthrie was born in Massachusettes in 1979 and is Arlo Guthrie's youngest daughter. Though she knew early on she had inherited a family history of music-making, Sarah Lee grew up more drawn to theater and dance. It wasn't until she took the job of her father's tour manager (when she was 18) that she developed an interest in performing music. Soon after that, she teamed up with Johnny Irion (whose grandfather's brother was John Steinbeck) and Tao Rodriguez-Seeger (grandson of Pete) to form a trio called RIG. It wasn't until 2002, though, that Guthrie released her first solo album, later dropping a series of duo albums with her husband, Irion (starting with Entirely Live in 2004). The duo has released six albums together.